Iran has warned the USA against enlisting the Islamic Revolution Guards Corps (IRGC) as a terrorist group as it threatened to do, saying the move would be a “strategic mistake”. “We hope the US administration would not make such strategic mistake and stop continuing on its wrong path,” spokesman for the Foreign Ministry Bahram Qasemi said. “I think the United States should accept the consequences of its wrong decisions,” the spokesman stressed, expressing hope that people in the USA, who follow common sense, take appropriate measures and try to stop such dangerous decisions. The spokesman who was speaking in his weekly news briefing Monday also commented on Europe’s approach towards the nuclear deal, known as the Joint Comprehensive Plan of Action (JCPOA). “We are waiting to see what the future will bring…But what is clear is that European governments, for different reasons, in general, are quite serious in standing against US policies,” the Foreign Ministry spokesman was quoted by IRNA as saying. Regarding the issue of missile development, he said Iran has repeatedly made it clear that its missile program is part of its defensive policies and is not in contradiction with UN Resolution 2231. 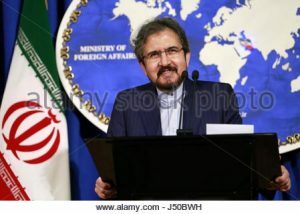 Iran has the final say in deciding on its defense issues and it will not let other countries to intervene, Qasemi went on saying. Written by: Jaber Ali on October 9, 2017. Posted by Jaber Ali on Oct 9 2017. Filed under Gulf News, Headlines, World News. You can follow any responses to this entry through the RSS 2.0. Both comments and pings are currently closed.